And now for the obligatory dose of daredevil doings, a very brave individual just completed the world’s first skydive from a drone. According to Engadget, this incredible stunt took place from a thousand feet in the air, and there’s video footage that we absolutely must dissect to see whether this jump fits the bucket list criteria. But TBH, we’re kind of nervous to watch it alone, so let’s hold sweaty-palmed hands and take a look-see together, shall we? Yeah, we know Bella Hadid went skydiving and made it look all glam and stuff, but she wasn’t dangling from a drone, now was she? No, she was not, but this man was. 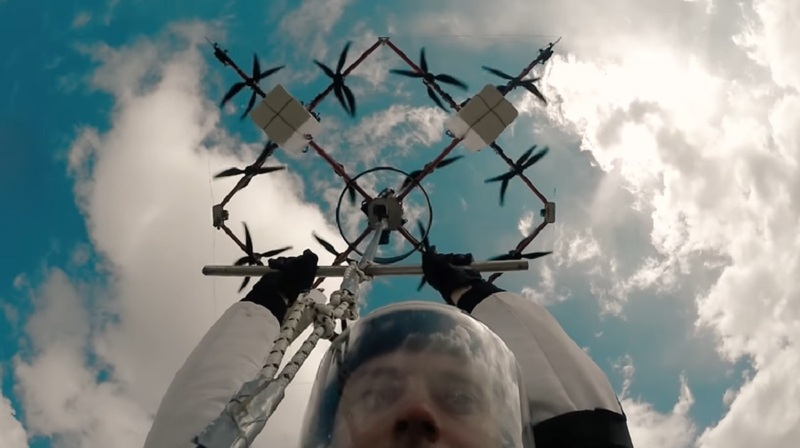 Skydiver Ingus Augustkalns was perched on a tower a 28-propeller drone manufactured by Latvian company Aerones flew to him and scooped him up. After hanging on to the flying device, Augustkalns released his grip and employ the assistance of a parachute to make a safe landing on the ground. "We did it! We accomplished the World’s first human flight with the drone and jump at high altitude," Aerones said on YouTube. "On May 12, our 28-propeller Aerones’s drone lifted skydiver Ingus Augstkalns at a height of 330 metres, from where he accomplished the planned jump and landing with the parachute." Aerones’ beastly drone is so massive that it had to be transported to the launch site by several men. The flying machine can lift up to 220 pounds of cargo, which means that it is more than capable of carrying a guy wearing a Santa suit or meeting our demands as the personal assistant drone of our futuristic dreams.